The only problem is that most of these accommodation options are geared towards short term visitors — tourists passing through the city for a few days, business travellers and people who need a place to stay for a night or two. If you’re staying in Bangkok long term, you’ll get the best standard of accommodation and the best pricing by signing a long term lease with either an apartment building or a private condo owner. To help you avoid spending day after day searching for long term accommodation (and paying more than you need to), we’ve put together a detailed guide to finding cheap, high quality long term accommodation in Bangkok. Our guide is sorted by price, with cheaper options right below and more luxurious, expensive options further down the page. Apartments in Bangkok are units in buildings that are owned entirely by the developer, with no privately owned units. When you rent an apartment, you pay rent (and in some cases, electricity and water) directly to the company that owns the building. 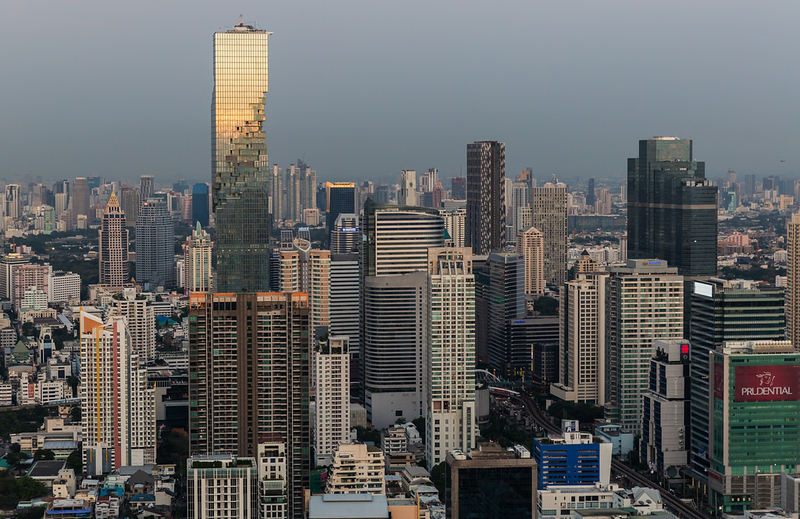 In Bangkok, apartments tend to be smaller and cheaper than condominiums. If you’re willing to live 15-20 minutes from the centre of town, you can find livable apartments in Bangkok for as little as 5,000 baht per month. Most apartments require a three to 12 month lease. Condos are privately owned apartments that you rent directly from the owner. For the most part, condos in Bangkok are a higher quality form of accommodation than apartments. They usually come fully furnished and have facilities like swimming pools and gyms. The upside of renting a condo is better comfort and a higher quality unit, as well as a (typically, but not always) newer building. The downside is that you’ll need to sign a six to 12 month lease for most condos, locking you into the same building for at least half a year. If you’re here long term, you can get great deals on condominiums in Bangkok by negotiating with the owner — something you usually can’t do in an apartment building. We’ll cover this in more detail a little later, along with specific recommendations to get the lowest prices. Serviced apartments are higher-end apartments that include hotel services, such as cleaning, laundry and occasionally an on-site restaurant. At the higher end of the price range, they’ll also have facilities like swimming pools and gyms. For the most part, serviced apartments are quite experience. 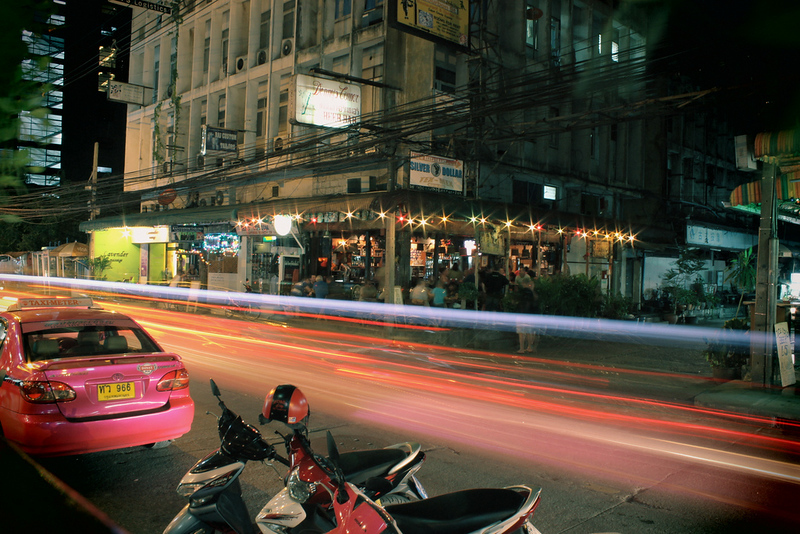 However, there are a few cheap, high quality gems hidden around Bangkok that we’ll share further down the page. In general, if you have a monthly accommodation budget of 12,000 baht or less, you’ll find the best value for money by renting an apartment. If you have 12,000 or more to spend and you’re interested in living in Bangkok for at least six months, you’ll be better off renting a condo. Bangkok is full of affordable apartment buildings that offer a comfortable place to stay at a fair price. Most apartment buildings close to the BTS and MRT have English speaking staff, making it easy to call and ask for pricing information even if you don’t speak Thai. Since most apartments in Bangkok come fully furnished, you can move in right away with only your backpack and skip the customary trip to Ikea. Before we get into our list of apartment recommendations, it’s important to clear up a few things regarding renting an apartment in Thailand. First, apartments in Thailand are rented directly from the building owner. As such, it’s not as easy to negotiate your rent as it is with a privately owned condominium where you can speak directly with the owner of the unit. This doesn’t mean that you can’t get a discount on your rent, just that it will be a little big harder and the discount, if any, probably won’t be as big. Second, as a tenant in an apartment building, you’ll need to pay your water and electricity bill to the building management directly. Many apartment buildings add a surcharge to your electricity bill, which can occasionally double the rate you’d pay in a condo. There’s not a lot you can do about this, except avoid apartment buildings that charge greedy utility rates. For reference, the government rate for electricity is typically four to five baht per unit, assuming normal consumption. Expect to pay six to seven baht a unit in an apartment. Third, you’ll need to sign a lease and pay a 1-2 month deposit before you can move into an apartment in Bangkok. Most apartment buildings offer discounted monthly rates for longer leases, making it valuable to ask if you plan on staying in Bangkok for a long time. 9Apartment is a Thai website that lists cheap apartments throughout the city, sorted by price and area. Since the website is aimed at Thais, there’s almost no artificial price inflation and the pictures tend to be accurate representations of the room you’ll get. The link above will take you to the English version of the website, which has translated listings for almost all of the buildings you’ll find on the Thai version. 9Apartment’s search feature isn’t particularly effective, so the best way to find an apartment in your price range is to browse through the entire inventory manually. You can also narrow your criteria to apartments close to a BTS or MRT station, which cuts out apartments located away from public transport. Once you’ve found an apartment that looks good and is priced within your budget, the best thing to do is call the front desk and check that rooms are still available. If yes, schedule a time to look at the apartment to confirm that it looks like the room in the pictures. We don’t recommend using the contact form on 9Apartment, since there’s a good chance your message will be ignored. When it comes to finding accommodation in Bangkok, it’s always best to call. 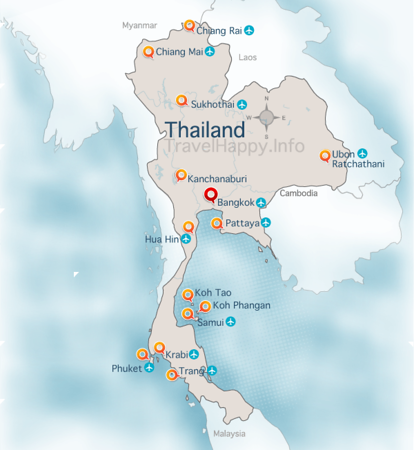 ThaiApartment is another apartment search website aimed at Thais and foreigners. It tends to feature more expensive apartments than 9Apartment, with a lot of options in the 20,000+ baht price range. Despite this, you’ll still find a lot of listings for cheaper apartments. One big advantage of ThaiApartment is its search feature, which is much better than the buggy search on 9Apartment. Using the search by BTS/MRT station feature, you can click on a station near your target location to bring up all of the available apartment buildings in the area. Once you’ve found an apartment that meets your criteria, the process is the same — call to see if any units are still available, then work out a time to tour the building in person. RentHub has a huge selection of apartment and condo listings, including a lot of buildings with rooms in the 5,000 to 10,000 baht per month range. It also has a simple BTS and MRT station search map that lets you search for apartments around specific stations. MrRoomFinder is an apartment and condo listing website that has a reasonably good selection of cheap apartments. Some of the listings are quite out of date, so it’s best to look at the most recently added properties to get an idea of prices and options. 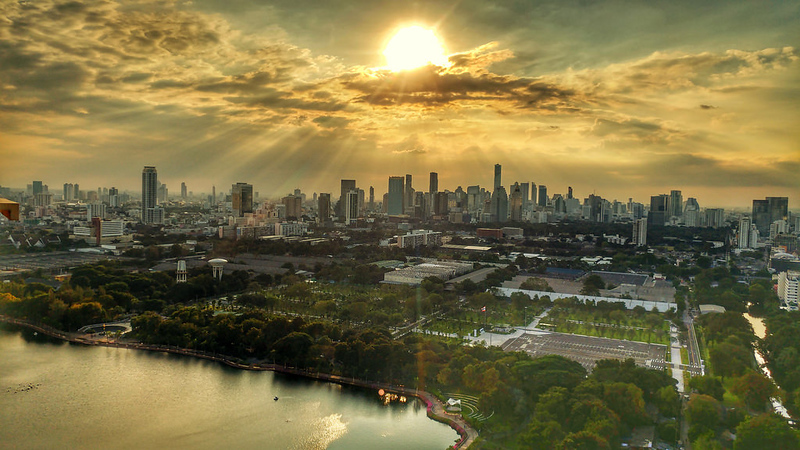 If you know the specific area of Bangkok you want to live in, one of the best ways to find cheap apartments is to walk the streets and talk to the receptionists of apartment buildings you find in the area. This is a great, albeit time consuming, way to find cheap apartments that aren’t listed online. If you spend a day or two exploring an area away from the main Sukhumvit/Silom stretch of the BTS, you’ll find a good selection of cheap, livable apartments. There are more useful sites listed on our Bangkok apartment listings page. Because apartments in Bangkok are rented directly from the building owner, you don’t have a huge amount of room to negotiate as a tenant. Usually, discounts are small and subject to you signing a lease of six months or longer. If you plan on staying for six months or a year, it’s worth asking for a discount on the rent. After all, the worst thing they can say is “no”. Just be aware that discounts for cheap apartments are rare, and usually in the 5-15% range even if successful. Avoid buildings located right next to BTS and MRT stations, as they tend to have higher monthly rents than buildings a five to 10 minute walk away. Avoid the main stretches of the BTS, from Siam to Ekkamai on the Sukhumvit Line and Sala Daeng to Saphan Taksin on the Silom Line, as apartments in these areas usually come with a premium price. Look for new, recently completed buildings, as they’re more likely to have low occupancy rates and staff willing to work out a deal. One of the dilemmas of renting a cheap apartment in Bangkok is that the most convenient areas to live in are rarely the most affordable. You can find incredible value for money when you live in an area 10-15 minutes from the BTS or MRT, but doing so often adds two 10-15 minute taxi rides to your daily routine. Add the taxi fares to your monthly rent and you’ll often spend less to rent a more expensive room in a better area. The area around Victory Monument (and major traffic roundabout and shopping area) is one of the best places in Bangkok for cheap accommodation. It has its own BTS station, is 10 minutes from Siam and hasn’t yet seen the price inflation of most neighbourhoods along Sukhumvit Rd. There are two ways to find apartments around Victory Monument. The first is to search online using the resources linked above. The second is to take the BTS to Victory Monument station and walk down Soi Rangnam, Ratchawithi Rd and other nearby streets looking for buildings. Good options around here include 21 Living Place and VP Tower on Soi Rangnam, both of which have clean, comfortable rooms for less than 15,000 baht per month. Cheaper options include Yupin Apartment and Ratchaprarop Tower Mansion, both of which are less than 10 minutes from the BTS station on foot. Previously a hub for English teachers and other expats in Bangkok on a limited budget, On Nut has gotten more expensive over the past few years. Still, it’s a good place to find apartments for less than 15,000 baht per month, as well as a few sub-10,000 baht budget gems. The Huay Khwang/Sutthisan area is served by the MRT and has several convenient shopping malls, making it a great place to stay. It’s also a good place to find a cheap serviced apartments like Diamond Residence and sub-5,000 baht apartments like P.P. Mansion Place. Surprisingly, there are still plenty of cheap apartments to be found along the main Sukhumvit Rd drag, including in “expensive” areas like Thong Lor and Asok. Varrzon Residence on Sukhumvit 36 offers new studios from 10,000 baht in one of Bangkok’s glitziest neighbourhoods, while Rompo Mansion has a variety of studios and suites 10 minutes away from Phrom Phong by taxi from 12,000 baht per month. For more areas to rent in Bangkok, check out our complete guide to Bangkok neighbourhoods and their long term accommodation options. If you’re staying in Bangkok long term and have more than 12,000 to spend each month on rent, you’ll get the best accommodation by renting a condominium instead of an apartment. Condos in Bangkok range in price from just a few thousand baht per month for a small unit in an outer suburb to 200,000+ baht per month for a luxurious penthouse. The price for units can vary hugely from suburb to suburb and building to building. Prakard is Thailand’s biggest real estate forum, with tens of thousands of users and millions of posts. Listings on Prakard are sorted into subforums for each apartment building, so you’ll need to know the building you’re interested in before you start looking. If you already know the area you’d like to rent in, you can click through to the subforum for that area and browse condo buildings. This takes a while but gives you a good understanding of the options available in each part of Bangkok. Once you’ve found a building, you can view rental and sale listings posted by condo owners and agents. Prakard is usually the first place agents list available units (after their own website), and as a result it usually has fresher listings than other condo listing websites. By far the biggest advantage of Prakard is that it lets you view a wide range of units in different buildings next to each other. This gives you a good understanding of the market price for each development, with less price inflation than you’d get by calling a real estate agent directly. If you’ve found a building and unit you think is worth renting, it’s worth searching for similar units in the same building. Search “site:prakard.com [building name] [unit type]” on Google and you’ll normally be able to find listings for similar units dating back several years. For example, your search query might be “site:prakard.com the empire place one bedroom”. If you find similar units, make a note of the prices. If any are cheaper, make sure you mention it to the agent and see if they can match the price of a similar unit. If you can find several recent listings with cheaper rental prices, you can usually use them as bargaining tools. For the most part, condominiums on Prakard are either priced fairly or slightly over the market value. Most of the time, you can get 10-20% off the rental price by using the price search trick above or simply negotiating with the agent or landlord after you view the condo. We’ll share some more tips for negotiation a little further down the page. It’s always best to view each condo before you even start talking about the price, since you’ll get a better feel for the unit after you see it in person. Bangkok has no shortage of real estate agents catering to foreigners. Working with an agent is almost always the fastest way to find and move into a condo, but you’ll often end up paying far more than you should if you aren’t aware of the market rate and willing to negotiate. Some of the more popular foreigner-focused real estate agencies are Bangkok Condo Finder, Company Vauban and Bangkok Condo Rentals. Since these agencies mostly cater to foreigners, they’re a good choice if you have a budget of 30,000+ baht per month and want to live in an international area like Sukhumvit or Silom. If you want to live in Ratchada, Chatuchak, Lad Prao or other areas that aren’t as popular with foreigners, or you have a lower monthly budget, you’ll usually find a better selection of units on Prakard. Real estate agents are convenient and easy to work with. It’s easy to line up five to 10 different units with a single phone call. However, you’ll usually end up being quoted rental prices that are above the market rate, often by 20 percent or more. The best way to avoid this is to ask the agent to email you a list of the condominiums you’ll be visiting and the room types before you actually view the rooms. Do the Prakard check above and you’ll get a good understanding of the market price for each type of condo you view. Most real estate agents are willing to negotiate and will go down to the market price if you’re persistent and informed (after all, they want to make a deal and earn a commission), but you can easily end up overpaying if you rent a room without actually understanding its value. HipFlat is an extremely useful website that aggregates condo listings from a huge number of real estate websites in Bangkok, tracks historical pricing data and lists them on a convenient page for each building in the city. This makes it a great tool for quickly working out the market price for condos in a building. It’s also great for weeding out co-agent listings (listings advertised by one agent, but managed by an entirely separate real estate agency) that usually have inflated prices. If you know the building you want to rent in, HipFlat is a useful tool for negotiating prices and discovering how much other unit owners and agents are asking for. You can also use it to find new condo buildings and units, although many of the units listed on the site are out of date. Learn the market price and make a better offer. Most real estate agents in Bangkok overprice their condos by 10-30%, usually at the request of the landlord. If you’re aware of the market price for units in the building, you can make a competitive offer more in line with what other tenants are paying. Rent a bigger unit. Since most expats in Bangkok are singles or couples, there’s far less demand for family-sized units as there is for one and two-bedroom condos. If you prefer some extra living space, you can usually negotiate a lower rental price (on a per square metre basis) if you lease a larger condo. Offer to sign a longer lease. Condos in Bangkok can sit empty for months between each tenant, which means landlords are usually happy to reduce the rental price if you can sign an 18 or 24 month contract. Look for older, renovated condos. Rents in Bangkok usually fall as units age, making it easier to get a good deal on older units than new condos. If you can tolerate a slightly dated building, you can get great deals by looking for renovated condos in buildings from the 1990s. Look for units that have sat empty for several months. The longer a condo is empty, the more receptive the landlord usually is to lower offers. If you can find a unit that’s sat empty for more than three months, you’ll generally be in a stronger position to negotiate a better rental price. Whether you’re planning to rent a condo or an apartment, the first step in your accommodation hunt should be choosing the right area. Our Where To Rent In Bangkok guide covers the city’s best areas for expats, from “undiscovered” districts to the most popular neighbourhoods.